The Abbott Street Carriage House is in an ideal location, one half block from Okanagan Lake and Kinsmen Park. Step out the door to walk, jog or bike along the Abbott Street Parkway or stroll on over to the tennis courts in the park. The carriage house is also within walking distance of the South Pandosy shopping district, a unique area with a blend of coffee shops, boutique stores and bike rentals. The Mission Shopping Center contains all necessary amenities, and the Kelowna General Hospital is a five minute walk away. Downtown Kelowna is a short, flat bike ride along the parkway, and numerous beaches dot the lakeshore. 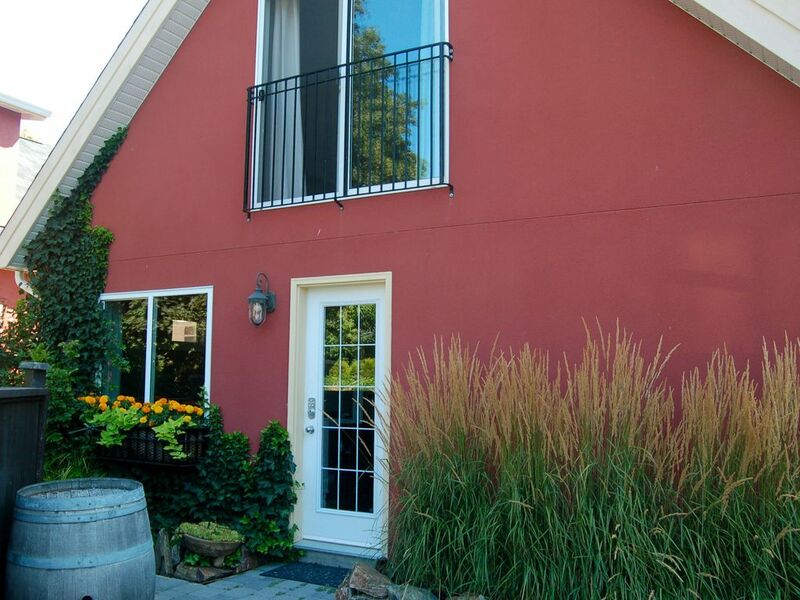 For sports enthusiasts, the carriage house is situated on or near by event routes such as the Apple Triathalon, the Kelowna Marathon and the Granfondo. The carriage house is new and bright with a peek-a-boo view of the lake. Modern appliances, new furnishings, and an open-area concept have created a comfortable and relaxed atmosphere. Between location, style and comfort, this little gem has it all! Bathroom amenities and blow dryer supplied. We had a great stay at South Pandosy. We loved being able to walk to the coffee shops and quaint shops close by. We will be back. Thank you again! Clean, convenient, quiet and modern. Great location, walking distance to downtown and shopping on a quiet residential street and just one block from the lake. Very clean, pleasing space and design, very good location. Good host. This cute little carriage house was a pleasure to stay in. Spacious and private in a quiet neighbohood. 1 block from the beach and 3 blocks to good restaurants. The location of the carriage house was fabulous....so close to everything. It was especially nice to be so close to the lake and we were able to bike to lots of restaurants and coffee shops. The carriage house itself was very clean and was well represented in the photos on the website. We will stay again! The Abbott Street Carriage House is situated in an ideal location, a half a block from the lake and Kinsmen Park on the Abbott Street Parkway. Walk out your door to stroll, run or pedal on or take a few strides over to the tennis courts or down to the lake.